Sentient species that we are, Homo sapiens is able to understand the shape, extent, and value of Earth's biodiversity. Indeed, we have a responsibility, as well as a self-interest, to value it. This volume is the fourth in a series of publications dealing with standard methods for inventorying and monitoring the biodiversity of different taxa (e.g., see Heyer, et al. 1994; Wilson et al. 1996; Mueller, et al. 2004). The impetus for the first volume was the sudden realization in the late 1980s-early 1990s that amphibian populations were declining globally, for unknown reasons. Determining the scope (numbers of species affected) and the magnitude of the declines was hampered by the absence of baseline data with which to compare contemporary population levels and the lack of comparability among data sets that were available. About the time that the amphibian declines were first being recognized, there were dramatic surges in interest and concern about the world-wide loss of biodiversity, even though various individuals and institutions had been sounding the alarm for decades. In 1986, the National Academy of Sciences and Smithsonian Institution sponsored a National Forum on BioDiversity, held in Washington, D.C., on September 21-24, and published the proceedings of that forum (see Wilson 1988). In 1992 (3-14 June) the United Nations held a Conference on Environment and Development (UNCED) in Rio de Janeiro, Brazil. The attendees, who numbered between 20,000 and 30,000, represented the governments of 178 countries as well as non-governmental organizations (NGOs) and the news media. One product of that meeting was The United Nations Convention on Biological Diversity often referred to as the Biodiversity Treaty. Recurring themes of the conference and the Convention were that countries needed to conserve their biological diversity and use their biological resources in a sustainable manner. At a meeting in April 2002, the Conference of the Parties (the decision-making body of the Convention) set as a goal a significant reduction in the rate of loss of biodiversity, which they hoped might be achieved by 2010, the United-Nations-designated International Year of Biodiversity. They recognized, however, that in most instances available taxonomic information was too limited to form a basis for decisions about the conservation and sustainable use of our living resources. To help reduce this 'taxonomic impediment, they established the Global Taxonomy Initiative to train taxonomists, expand scientific collecting, and increase the pace of taxonomic work, particularly the description of new species (SCBD 2008). After the Rio meeting, many countries rose to the challenge, designating new protected areas, developing environmental education programs, and increasing efforts to manage exploited and threatened ecosystems. In addition, countries, companies, and conservationists began placing more emphasis on sustainable development and habitat restoration rather than just on the protection of pristine areas, but at the same time, recognizing the importance of ecosystem services (carbon sequestration, clean air and water, soil maintenance, pollinator populations and food production, sources of raw materials with newly recognized uses) whose economic value has been largely unacknowledged. Nevertheless, by the time you read this, the 2010 deadline will have passed, and though rates have perhaps slowed, habitats continue to shrink, species continue to decline or go extinct (Hoffman et al. 2010; Marton-Lefèvre 2010), and government and conservation groups continue to base decisions regarding conservation, management, and development on woefully inadequate and incomplete data about the distributions and population statuses of species. At a time when our need to use our resources more efficiently and maintain healthy populations of the species and ecosystems of greatest value to the health of the planet, we still do not know the species composition of most ecosystems, understand the function of each in those ecosystems and how they maintain it, or appreciate the impact the loss of any one of them might have. Without such information, conserving biodiversity, restoring degraded habitats, and reconstituting ecosystems will be impossible. Some twenty-five years after recognizing the global decline of amphibian populations, biologists and conservationists are becoming increasingly aware of declines in reptile populations (Gibbons et al. 2000; Yardley 2007; Sinervo 2010). And once again, we are faced with an absence of baseline data with which to make comparisons. Nearly 9,000 species of reptiles are known, and new taxa continue to be described at a prodigious rate. Uetz (2010) estimated that on average nearly 100 new species of reptiles were described each year between 1998 and 2008, a rate higher than that for any 10-y interval since 1758, and it continues to accelerate. Reptiles make up more than half of the biomass in some ecosystems and must play a significant role in ecosystem function. Yet, we have no knowledge of many components of their basic natural history. The lack of data may in part be attributable to the less charismatic nature (e.g., compared to bird and mammals) of these organisms that may even engender fear and hostility on the part of some-there is no 'Kermit' equivalent to speak for them. The herpetofaunas of many areas of Europe and much of eastern North America have been studied for more than 150 years. Regional summaries published from the late 19th to mid 20th centuries were followed by field guides to the species of most temperate regions. The guides included drawings of the species accompanied by descriptions and geographic distributions. Until quite recently there have not been field guides or regional summaries to reptiles in most tropical regions although species descriptions are available and distributions are moderately well known. The basic components of their ecologies, in contrast, are not. For example, in a recent, comprehensive, and well illustrated field guide to the reptiles of South-east Asia, Das (2010) included in each species account a section titled "Habitat and Behavior." More frequently than not, these sections refer to diet, reproductive behavior and other natural history traits with notations such as "unknown," "nothing known," and "unstudied." A review of the accounts revealed that 288 (67%) of 428 species of lizards in 11 families were data-deficient with values ranging from 0 percent for a few small, well-studied families (e.g. Lanthanotidae and Varanidae) to highs of 84 and 93 percent, respectively for species in the poorly know families Anguidae and Dibamidae. Similarly, 260 (54%) of 482 species of snakes in 12 families were data deficient, ranging from 0 percent for snakes in the families Pythonidae and Xenopeltidae to 59 and 82 percent for species in the families Colubridae and Typhlopidae, respectively. Not surprising, venomous species are moderately well studied with only about 40 percent of the species in both the Elapidae and the Viperidae being data-deficient. Values for lizards and snakes throughout the Neotropics are likely similar (RWM, pers. observ.). Thus, while field guides are very useful for introducing the reptiles of an area to both professionals and amateurs, the existence of such books in no way signals that knowledge of the animals' biologies is even adequate. That belief, the 'field guide syndrome,' rarely reflects reality. Even in parts of the world where reptiles have been well studied, basic knowledge of the natural history of most species is poorly known, and knowledge gaps are rarely reported in field guides. Given the increasing rates of discovery of new taxa, the better sampling of poorly known geographic areas, and the increasing number of local herpetologists carrying out quality research on reptiles in Asia, Africa, and the Americas, progress is being made. Recent publications reflect those advances (e.g., Spawls et al. 2002; Carreira et al., 2005; Das 2010). We hope that this volume will contribute to that effort. In this volume we provide information on carrying out standardized quantitative surveys of reptile biodiversity that can be compared across habitats and through time. We include chapters addressing issues to consider when planning a study, selecting sampling techniques, performing a survey, and analyzing the data obtained. 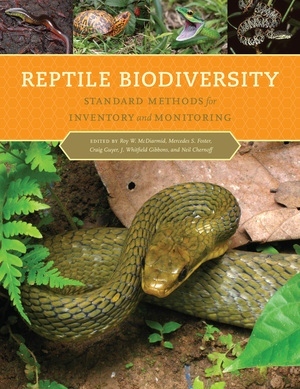 It is our fervent hope that this volume will motivate scientists, managers, conservationists, and nature lovers, whether employed by governments or conservation groups, or simply aficionados of reptiles, to carry out surveys of the biodiversity of this poorly know, but exceedingly important group. Throughout this book we advocate the use of standard methods for inventory and monitoring. Standard methods increase the comparability of data and decrease the effects of variables extraneous to a study. Nevertheless, because reptile species exhibit such a wide range of morphologies, behaviors, and ecologies, it is impossible to identify a single technique that will sample all members of a reptile community equally. Species differ, including closely related forms, and so do groups within species (e.g., males and females, juveniles and adults, and reproductive and non-reproductive individuals). How many and which techniques will be employed will depend largely on the intent of a study and whether it focuses on a single species, members of a particular behavioral or ecological guild, or all members of a community. And though a single species may be sampled with more than one technique, studies of whole communities will require the use of several. Obviously, techniques appropriate for aquatic turtles will be less than relevant for sampling arboreal lizards. In fact we encourage the use of more than one technique when time, personnel, and other resources permit. It is possible to sample many groups of reptiles quite appropriately with several different techniques or variations of a single technique. And most field biologists have favorites developed by trial and error in the field or learned at their mentor's knee. We are not suggesting that the techniques we have identified are the only appropriate ones or even the very best for a particular group. Rather we have selected those that we believe can best be standardized, are easiest to use with the least likelihood of error, provide the greatest return for the effort and resources expended, and yet produce scientifically sound and statistically rigorous data. However, when comparing different sites or different times, even employing a standard sampling technique is insufficient if investigators do not adhere strictly to the indicated protocol, something that we strongly encourage. We also recommend that investigators record detailed metadata (i.e., data about the data) including not only when and how the primary data were collected, but also the locations of study sites and when and how to access them; the distribution and nature of habitats and other environmental features within those sites that are important for reptiles (maps and photographs are very useful); data on weather conditions at the time of collecting; descriptions of training provided to technicians, assistants, and volunteers; lists of vouchers (specimens, photographs, videos, etc.) collected and where they are deposited; and so forth. Such information significantly increases the value of the primary data and enables future investigators to duplicate previous work as closely as possible. Various techniques do exist that allow investigators to manipulate or transform data so that it may be possible to compare them with data collected in other ways. Nevertheless, we recommend that investigators use standard protocols whenever possible. Our ignorance of reptile biodiversity (and the general biodiversity of the planet) is enormous, and habitat destruction and species loss are proceeding apace. Time is short; personnel are few; resources are limited. The use of non-standard methods to assess the biodiversity of reptiles is a luxury we can no longer afford. This volume is intended for use by government personnel, conservationists, managers, professional scientists, and amateurs throughout the world. It should be accessible to anyone with a college degree in biological or environmental science but should also be appropriate as a training manual in workshops for individuals with limited formal education. We view it as a self-contained volume on the basis of which a survey of reptile biodiversity can be accomplished. Nevertheless, we have provided extensive references to books and to the primary literature so that individuals working in especially difficult areas or habitats or with especially problematic data can access specialized information applicable to unusual situations. We have also abbreviated or eliminated sections on sources of supplies, chemical formulae, and so forth that may have been more extensive in other volumes because such information is easily available on the increasingly ubiquitous internet. We emphasize quantitative methods over the simple listing of species present in an area because such data are of much greater utility in recognizing and documenting changes in population levels. We recognize, however, that quantitative surveys are not always possible, particularly when time, personnel, and other resources are limited. Nevertheless, any information that contributes to our knowledge of species' distributions, both geographically and ecologically, and seasonal activities is worthwhile, and we encourage researchers to take advantage of opportunities to work in poorly know areas. From tiny, burrowing lizards to rainforest canopy-dwellers and giant crocodiles, reptile populations everywhere are changing. Yet government and conservation groups are often forced to make important decisions about reptile conservation and management based on inadequate or incomplete data. With contributions from nearly seventy specialists, this volume offers a comprehensive guide to the best methods for carrying out standardized quantitative and qualitative surveys of reptiles, while maximizing comparability of data between sites, across habitats and taxa, and over time. The contributors discuss each method, provide detailed protocols for its implementation, and suggest ways to analyze the data, making this volume an essential resource for monitoring and inventorying reptile abundance, population status, and biodiversity. Roy W. McDiarmid is a Research Zoologist and Curator of Reptiles for the USGS Patuxent Wildlife Research Center at the National Museum of Natural History. Mercedes S. Foster is a Research Zoologist and Curator of Birds for the USGS Patuxent Wildlife Research Center at the National Museum of Natural History. Craig Guyer is Professor of Biological Sciences at Auburn University. J. Whitfield Gibbons is Professor of Ecology at the University of Georgia and former head of the Environmental Outreach and Education program at the Savannah River Ecology Laboratory. Neil Chernoff is a scientist at the National Health and Environmental Effects Research Laboratory of the U.S. Environmental Protection Agency. “Kudos to the editors and contributors to this book. From the perspective of a non-ecologist such as myself, who only occasionally needs to intensively sample a particular site or habitat, the quality and clarity of this book has been well worth the wait.”—Jack W. Sites, Jr.
Handheld Computers for Digital Data Collection Carlton J. Rochester and Robert N.
Appendix D. Collecting and preserving tissues for biochemical analyses James A. 2. Snake hibernacula and communal denning Robert N. Reed, Cameron A.